Verdi’s farewell to the theater was telecast today by the Metropolitan Opera. This new production staged by Robert Carsen replaces the Zeffirelli Falstaff that debuted in 1964. I’ve not been a fan of Carsen’s work and was very apprehensive about its worth when I heard that he moved the time from Elizabethan England to the England of 1950. But apprehension was replaced by admiration. The performance was the best Falstaff I’ve ever seen. My first Falstaff was the second performance of Zeffirelli’s staging in 1964. Fernando Corena sang the title role that evening. It was a part that was far too high for the great basso-buffo. Leonard Bernstein gave a great reading of the score. 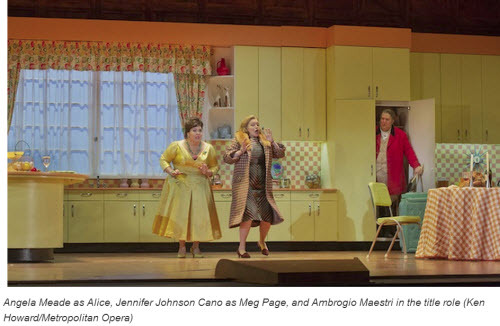 This Falstaff marked the second opera James Levine has conducted since his return to the Met’s podium after a two year absence due poor health. Though confined to a motorized wheel chair he brought all the vitality and sweep that Verdi’s unique masterpiece demands. Levine was criticized as being slightly off his game at the first performance of this run, but this afternoon everything flowed like hot mercury. Falstaff stands alone among the supreme works in this genre. The speed of its action, the characterization of its every word, the dazzling orchestration, the intricate counterpoint all make it like nothing else in opera. 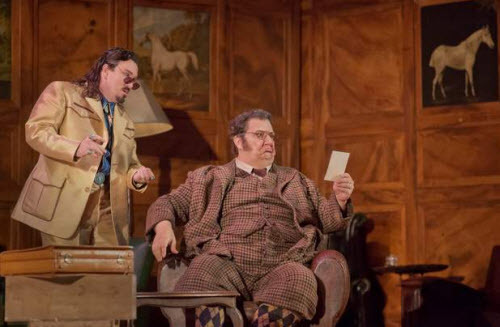 More than 50 years separate Falstaff from Nabucco; the vitality of the latter is preserved in the former, but added to this is unparalleled wisdom and technical skill. Falstaff can only be described as a miracle. The opera is now 120 years old. When it first appeared, and for some time thereafter, audiences were often left behind by its frenetic pace. If the opera has a flaw it’s the slow down at the beginning of the final scene that the story requires. The music here is beautiful, but things have moved so fast that you don’t want a pause. Now well into the 21st century audiences have caught up to Falstaff’s octogenarian composer. The opera currently ranks 32nd among all operas performed throughout the world. Carsen’s placing the action in post-war England had almost no effect on the opera – which is good. Carsen was likely trying to make something of the disappearance of class distinctions that characterized this period in England. And while that view can be inferred from the way the opera was staged, it can also be ignored. Starting the work in a hotel room, moving to a restaurant to a private club to the world’s largest kitchen to outside a stable (with a horse munching hay) all seemed natural, so universal is Falstaff’s persona. Harold Bloom, the great Shakespeare scholar at Yale, believes that the two central characters in Shakespeare’s plays are Falstaff and Hamlet. Falstaff is life. Hamlet is doubt and denial. The costumes were specific to the period. Falstaff wore long johns that got progressively dirtier as the show progressed. When he went to woo Alice he was dressed for the hounds. Ford looked like Roy Rogers in the scene where he bribes Falstaff to seduce his wife. It sounds silly, but it worked as did all the other garb. I just saw Bryn Terfel perform Falstaff in San Francisco. He was wonderful. I didn’t think his portrayal could be beaten, but Ambrogio Meastri was even better. He was Falstaff. A giant of a man, he is the fat knight. He’s performed the role more than 200 times and he has every glance and gesture down. And his singing is as good as is acting. Angela Meade was in fine voice in a part, Alice Ford, which requires fine ensemble singing rather than individual vocal display. Stephanie Blythe had a great time with Mistress Quickly’s antics. This part is typically given to great mezzos at the end of their careers. Blythe is in the middle of hers and still has more than enough voice to match her acting with great sound. Jennifer Johnson Cano’s part, Meg Page, is to fill in the great ensembles – which she did with dispatch. Lisette Oropesa (Nannetta) was pert as the teen age girl in love with a waiter (Carsen’s idea not Boito’s). Paolo Fanale was the other half of the love duo. Fenton is an almost impossible part to bring off. I’m not sure why; but even Giuseppe Di Stefano couldn’t get it right. It’s a tenorino part that never seems satisfactory. Ford gets a really big moment with È sogno…o realtá? in the second act. Franco Vassallo who was said to sound tight and under powered in the prima sounded full voiced and convincing in the telecast. Keith Jameson and Christian Van Horn looked too young to have been with Falstaff for 30 years, but were appropriately antic and smarmy. Carlo Bosi was Dr Caius. If Carsen had set the opera a little later, he really could have married Bardolfo. In summary, one of music’s greatest scores received an outstanding performance by the Met. The sets, costumes, directing, singing, and orchestral playing were all at the highest level. The highlight of the show, however, was the definitive portrayal of the title role by Ambrogio Maestri – a great artist at the peak of his form. I would add to all your comments about the staging, the singing, the acting, the conducting, is that the entire afternoon was just plain FUN in the purest sense. The transmission I attended came to life almost at the last moment before the opening comments from Renee Fleming, and I wondered if the storm in New York was affecting the broadcast. Fortunately, the broadcast began with no problems. There were a few “wobbles” in the video now and then, but they quickly resolved themselves. Nothing to spoil the fun, and there was a lot of that to go around. You’re absolutely correct. It was fun. I was smiling and laughing throughout the whole show. Also, I never saw a Falstaff audience break into spontaneous applause the way they did yesterday following Falstaff’s paean to his belly in the first scene.